If you’re on Twitter and use an Android phone, don’t be surprised if you see something new this winter: Tweets with links to news stories showing up at the top of your timeline when you first go online. 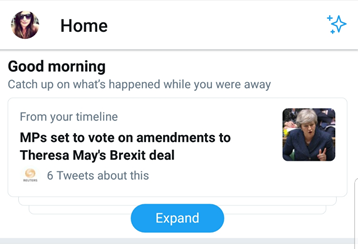 However, it’s unclear how long users need to be “away” before the missed news stories appear, but the "good morning" heading could be an indicator that it’s meant to be a morning news brief. Twitter has previously added features to help users stay up to date with what happened while they were offline (i.e. 2015 ‘while you were away’ and 2016 ‘never miss an important tweet’). What’s different about this latest update is its focus on news stories from news outlets whose Twitter handles you follow, rather than interesting or popular tweets, according to Mashable. While media outlets these days often complain about what a challenge online giant’s like Google and Facebook pose to their ability to monetize the content they produce, Twitter’s newest innovation appears likely to benefit news organizations. Another benefit is it helps to re-position the media as the provider of recent, intelligent, and newsworthy information. In recent years, news organizations have struggled to rise above the noise of social media and rightfully re-affirm themselves as the fourth estate. The news media’s ability to advocate, frame political issues, and tell personal stories will be reintroduced to the public, who have—for a while now—been relying heavily on pop culture influencers to bring news to their attention. No matter who you follow on Twitter, you should follow the news. For those who use the iOS version of Twitter, it’s unclear when this feature will be available. We’re also watching closely for the launch of other new features from Twitter coming in 2019, such as a new tag feature making it effortless to follow specific conversations, status updates, and indicators showing you're "online,” similar to Facebook’s chat.